Tom Dixon, the internationally acclaimed British designer, has designed a spectacular and festive suspended light installation in the welcome lane of Television Centre. The public will be able to pass beneath the work, which sits in a newly landscaped area on Wood Lane, throughout the winter months. 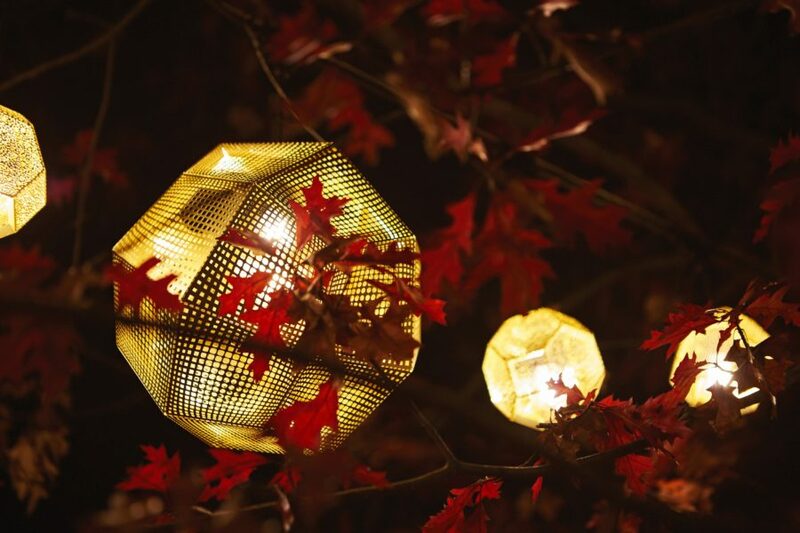 Eleven strings of lights, complete with 160 hanging geodesic brass pendants, are suspended between a pathway of bare-branched trees and theatrically illuminate the area. Tom Dixon, who was born and raised in West London, has designed each pendant using intricately etched and patterned razor thin brass sheets. These structures belong to his iconic Etch family of designs, which cast a complex web of shadows when illuminated. Television Centre’s welcome lane, which was the gateway for every visitor to the BBC until 2013, is now accessible to the public for the first time. Tom Dixon was commissioned by White Noise, a live research project about urban change based in White City, and Stanhope to conceptualise and complete the installation.